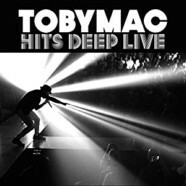 It’s been eight years since Toybmac went Alive and Transported– his last live CD/DVD but he’s back with Hits Deep Live, which shows exactly what a Tobymac show is like. A lot has changed with Tobymac since 2008. Eight years ago, Toby had a little heavier sound while he now has a more radio-friendly one. He’s also become more successful and has had his first-ever no. 1 album on the Billboard 200 with Eye On It and another Top Five album with 2015’s This Is Not a Test, which saw the highly successful tour of the same name in the Fall of 2015. The following Spring, he launched the latest edition of his immensely-well-received Hits Deep Tour, which he brings back every few years and shows some of the hottest artists in Christian music at the time. With an album as strong and impressive as This Is Not a Test, it seemed like the perfect time to release his second live CD/DVD and it shows from the very start. Now, if you haven’t been to a Tobymac show, it’s hard to explain exactly what the experience is like. Luckily, we have the live DVD to show and it does an impeccable job of capturing exactly what the show is all about. With this show, Tobymac doesn’t just play his new material- there’s a lot of it here but not all of it. We still get “Speak Life,” “Made to Love,” “Fresher Than a Night at the W,” “Catchafire” and other Tobymac favorites. The setlist is crafted and put together with sheer excellence and has something for every era of Tobymac fan. The Diverse City Band is on point, too. This is Tobymac and company at their best. It’s not just because the show was being filmed, either- it’s that way with every show. Tobymac is a perfectionist in everything he does. Every release is well-polished, sounds beautiful and is well-worth the money and Hits Deep Live is absolutely no exception. If you want the quintessential Tobymac concert, this is the way to go.